Quick overview Ally humans with technology to develop an agile, future-proof and superpowered workforce. The professional landscape is transforming, and the only way to maintain competitive advantage is to maximize the unique skills of your workforce. In Humanity Works, bestselling author, global workplace consultant and futurist Alexandra Levit provides a guide to making the most of the human traits of creativity, judgement, problem solving and interpersonal sensitivity. Revealing what the 'robot takeover' will really look like, how talent and machines can work side by side and how you can make organizational structures more agile and innovation focused, this book will prepare you to lead organizations of the future. 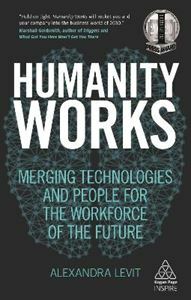 Humanity Works doesn't just explain the fascinating trends of the future of work; it condenses cutting-edge academic and business thinking to show what you can do about the future right now. Original, real-life case studies including Nestle, The Washington Post, Deloitte, and Pepsi combined with exercises and workplace tools will equip you for staying innovative and successful in the wake of major workplace disruption. Everything hinges on capturing the human edge in your organization.